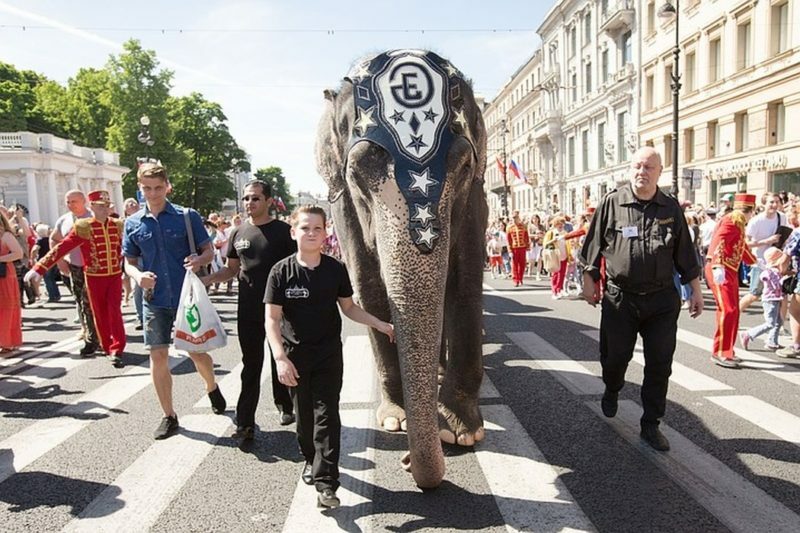 At the end of May, elephants were again seen on the streets and squares of St. Petersburg. They chewed the leaves and grass at the Mikhailovsky Arena, wandered around the Isaakievsky Square. Their appearance aroused excitement - after all, elephants in St. Petersburg were not more than 35 years old! Several generations of townspeople managed to grow up without elephants! Permanent residents of the northern capital of the elephants were until 1982. Then in the Leningrad Zoo died the last named Syun (Hero). Pet's biography corresponds to the name. At home in Vietnam, he worked as a loader in logging, visited the Japanese captivity, and after his escape, grandfather, in a venerable age even for an elephant, moved to the Soviet Union. He was presented to the young Leninists of the city-hero of Leningrad by the government of the Vietnamese Socialist Republic. "It was such a warlike, aggressive enough elephant that grew up in Vietnam and in Russian, as they say, not a boom-boom. He always broke something. There everything was done, welded from rails, from beams, but he kept digging something out, picking it off, "recalls the employee of the Leningrad Zoo Dmitry Vasiliev. Despite the grumpy nature, Syuna is still remembered with tenderness today. After all, after him, elephants in the city were only passing through - in the framework of circus tours. In 2003, St. Petersburg had a hope. King of Thailand gave the city on the 300th anniversary of two elephants. But so far they have not reached Russia. Apparently they were on their own, and they were frozen somewhere in Siberia, St. Petersburg jokes. Or they were enticed by another menagerie along the way. After all, today in St. Petersburg, giants simply have nowhere to settle. The Leningrad Zoo is located in the center of the city and is too modest in size. There were proposals to build warm enclosures on one of the outskirts, but decided - there are no elephants - there is no need for an elephant. But St. Petersburg has been a place of attraction for elephants throughout its history. The first eared giant appeared in the city in 1714 - a decade after its founding. Such a gift to the Emperor Peter was made by the Persian Shah Hussein. An animal on a sailboat was taken to Astrakhan, and from there the elephant walked on foot to the Northern capital. People in Russia, who never saw elephants, went out on the road with bread and salt to honor a strange animal. How to care for the elephant and what to feed, in those days did not know. Therefore, the ration of the animal was very refined. So the content of the elephant cost the treasury not cheap. According to M.I.Pylyaev, 1500 poods of cane were released per year, 136 poods of 35 pounds of millet, 365 poods of flour, 27 poods of 36 pounds of sugar, about 7 pounds of cinnamon, cardamom, cloves, nutmegs, 45 poods of salt, and also ... 40 buckets of grape wine and 60 buckets of vodka. The latter was required for calming and a good sleep of the animal, but after it turned out that alcohol was more often found on the table of riders. Elephants taught people to "hang around"
It is known that Elephants are a wonder in our country. They were walking elephants along Elephant Street. Now it is called Suvorovsky prospect. The newspaper "Peterburgskie Vedomosti" remembers even curious cases. For example, during one of the walks elephants, "being angry with each other about females, began to rage". Three of them broke into the city. Two soon caught, and the third "went through the garden, broke a wooden fence and went to the Vasilievsky Island," where, according to eyewitnesses, which the newspaper refers to, "broke the Chukhon village." Elephants even became an incentive for road works in the city - Anichkov Bridge, through which they had to pass, was dilapidated and narrow. Joiner Boles Boles reported to the Chancellery from the buildings that "Anichkov Bridge is in considerable dilapidation, the planks on it are penetrated through , and it is necessary to repair the bridge, so that there was no danger, and the elephants could not have any damage." From the treasury, funds were allocated, the bridge was repaired and expanded. Elephants safely moved through the Fontanka and were placed in a special elephant. Now on this site is the building of the Oktyabrskaya Hotel on Vosstaniya Square opposite the Moscow Railway Station. Apparently, the first in Russia image of an elephant is among the unique stone decoration of the St. George's Cathedral in the town of Yuryev-Polsky in the Vladimir region and dates from the middle of the 13th century. According to the chronicler, in 1234 Svyatoslav, the son of Vsevolod III the Great Nest, built a church. In the XV century, the building collapsed. When the cathedral was rebuilt, "carved stones" were built into the walls of the building from the old church. It was there that images of mythological animals resembling elephants were discovered. Where did the elephant come from on the monument of ancient Russian architecture? If you look closely - his ears are more hare, there are wool curls on his body, and claws on his legs. This suggests that the artist drew an outlandish beast not from "nature", but, most likely, on the basis of illustrations to Byzantine and Persian manuscripts. That is, too - a living elephant has never seen.